It was exactly 8am, and I was fast asleep in bed on a silent Sunday, when the body of a small child landed directly on my head. 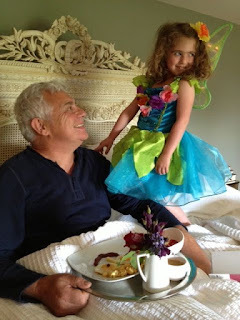 “Happy Father’s Day,” Izzy screamed in my ear, and started bouncing on my tummy. She was wearing a bright blue and green princess dress, bedecked with pink daffodils and sequins. Behind her, Jo carried a tray. I was right to be wary. 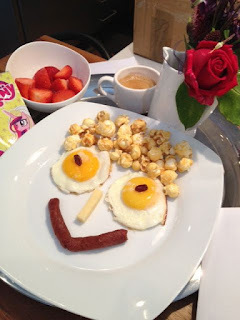 Breakfast in bed had arrived as a smiley face: two fried eggs for eyes, raisins for pupils, a sliver of cheese for the nose, something weird and worm-like for a mouth, and hair made of popcorn. Behind her, Jo frantically shook her head in warning. “Boots licked it,” she whispered. Boots is our English shepherd puppy. He’s already as big as a pony. On all fours he stands as tall as Izzy, and when he bounces up on his hind legs, he can comfortably lick my nose. Reaching a smiley face on the kitchen table was no challenge. Izzy handed me a little packet. 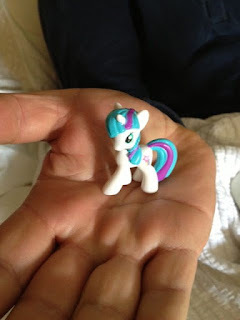 It contained a tiny purple and blue pony. “I bought it with money from my minibank,” she said proudly. Izzy has inherited her mother’s habit of raiding my jeans for cash – except she does it while I’m still wearing them. As a result, her moneybox is packed with coins – she has far more liquid assets than me. My daughter is a serial shopper in training. On Friday, Izzy’s preschool had commanded all dads to take a morning off work and come to school with their four-year-olds. Lawyers, farmers, businessmen: we all meekly trekked through the playground. By nine thirty more than a dozen grown men were sitting cross-legged on the carpet, playing with zoo animals and pieces of Lego. We were shown the worm house and the box containing the dead frog: “squashed by a car – it used to be slimy, now it’s hard,” explained Izzy, sounding like David Attenborough. Then we had orange juice and biscuits. It was fascinating to see four-year-old society at first hand. Izzy and I were quietly playing pirates together when a little boy came and stole our ship. Instead of snatching it back or bursting into tears, Izzy just turned to me and said sweetly, “Don’t worry, Daddy, I’ll get you another one”. She found us a Viking ship, then we added some warriors and a tiger and sailed round the room chasing the pirate thief. “Grr, I’m a tiger coming to get you,” I growled. “Do grow up, Daddy,” said Izzy. Suddenly we heard the shake of a rattle, and everyone stopped still and put their hands in the air. One by one we dads did the same. It was story time. We sat in a circle and the teacher read us book called “I Love My Daddy”. According to the author, Daddies are silly and funny and their main function in life is to have tummies bounced on. So that’s where she gets it. 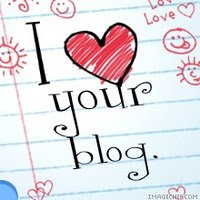 Then the teacher showed us a book that all the children had written entitled “Why I love Daddy”. Izzy’s page had a picture of our family. There was Jo, a mass of long hair, and towering over her was a tiny bump on top of a huge circle. “That’s your tummy, Daddy,” she shrieked, and everybody laughed. “You’re like Daddy Pig,” she went on, until the teacher tactfully cut her off with another rattle shake. What a fantastic way of gaining silence: if only all international conflict could be halted with one shake of a rattle. I really don’t care if Father’s Day is an American commercial creation, exploited by Hallmark to sell more cards. Most of my friends despise and ignore it, but personally I rather enjoy milking the only day of the year when I’m allowed to do exactly what I want. Which, yesterday, was precisely nothing at all. Perfect.